Lately I’ve been seeing a lot of people, usually on Facebook, say ‘he is my whole world’or ‘I am nothing without him’. I guess it’s sweet, but for me, personally, I feel like I don’t NEED my other half to fill up every second of every day. He knows more than most that, whilst I love our time together, I also love my alone time – to do the things I wouldn’t do when I was with him, like read or watch ‘Dance Moms’ or ‘Pretty Little Liars’. When we aren’t together, I enjoy knitting, going out with friends, writing and gaining new hobbies. So, while he is a huge part of my life, I feel like there’s a fine balance between being able to ultimately tangle your lives together to grow and develop as a couple and individually and just centring your whole life around one person (been there, done that, got the t-shirt and in the end it just wasn’t worth it). For me, it’s not a NEED that I have in my life. I don’t NEED my boyfriend to put up shelves in my room, it’s helpful, but otherwise I’ll learn to do it myself and gain a new skill. I don’t NEED him to be happy for me to be happy because then what happens when he’s at work? Or he’s not in a good mood? I feel like you putting your happiness into someone else is incredibly romanticised and it’s an ‘in’ thing to say; ‘our moods are the same, if he’s not happy, then neither am I’ but honestly… what the flip?? I’m a massive believer in creating your own happiness and in relationships it’s no different! While you should 100% make each other happy, you should also make yourself happy too – if you’re happy in yourself, by yourself, you will attract happiness and it just starts to naturally cultivate itself, which helps your partner feel happier too! I also think there’s something more meaningful than I NEED him, which is simply one little word change. WANT. My boyfriend felt he needed someone to talk to the other day, he didn’t need to talk to me otherwise his whole world would’ve crumbled, he had friends and family he could’ve called instead, yet he specifically chose to want to call me and I appreciate that way more than I would’ve if he NEEDED only me. The word WANT feels more like a choice than NEED. To me, the word need is more like ‘I don’t have a choice but you’, but want is saying; yeah, other men could help me with… but I would like you to because you’re wonderful to be around. I am a strong believer that how you view yourself directly relates to how you allow others to treat you, in a relationship, a friendship, even at work, if you truly believe that you are worthy of being loved, then you won’t stand for anyone treating you any different. Of course, I would love for this to be a conversation, so if you’d like to be involved, feel free to comment down below! Disclaimer; These are just my personal thoughts and opinions, I am open-minded to others views on the same topic and I am not meaning to make anyone feel as if they are being judged. Nor do I believe I have all the right answers and have a perfect relationship with myself or other people. Completely agree with you – I think there is a strong difference like you said! I do need Ben as we have two insane dogs now and I can’t contemplate coping with them for more than 2 days by myself haha. But in all seriousness it’s more important to want something than need them, the bigger picture is there and you still choose them. 👏🏻👏🏻👏🏻 YES! Needing someone really ends up being unhealthy, and I’ve been there believe me. I’m single at the moment and have made a solumn vow never to NEED a partner again. My life totally unravelled when the guy I was with turned out be completely different to what I thought he was, and I’m never going there again. Loved this post! I definitely think the media often puts emphasis on how you need a partner to be complete. Myself and chris have been together for 6 years and I wouldn’t be without him, but there was plenty of time before him when I thought I needed someone because that was portrayed. Such a great post, I think ‘need’ is an overused term in relationships and as you say, moods are never quite the same, its clear you may feel sad if you saw your partner crying and upset over something, but I think sometimes you need to have ‘opposite’ moods at times for instance, if I’m crying, I probably want the other person to cheer me up, friend, parent husband, anyone, just make me feel better while respecting why I’m down! This was a really interesting post actually! I haven’t got too many strong opinions on it but I think this was really well written and has given quite a bit of good for thought! Loved this Jess. You hit the nail on the head with this one. There is a fine line between needing someone and wanting someone and it’s when you realise this that your world changes. 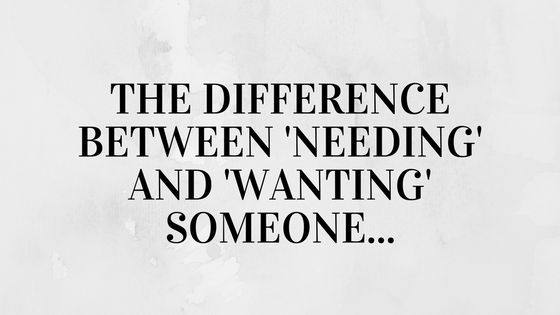 The second you need someone means something else is missing from your life to make the need a central focus. That’s my opinion anyway!